Back around to Thursday again and tomorrow is the last day of the 3rd 9 weeks for us. That means only 8 more weeks of the Handmade School Year to go. We are actually leaving on the Friday before the last week of school to head off on vacation. Don't worry, her grades are actually turned in on that Friday, so the last week is a fun week. And both principals are in on it, so it's all good. So, do you know what that means? Only about 30 outfits to go. Wow, time has flown. AND we are almost to our 100th outfit. They always do something special for the 100th day of school, so we are going to do a special giveaway for our 100th outfit. Check back next week for more details! So, onto today's outfit. We are still doing Disney. 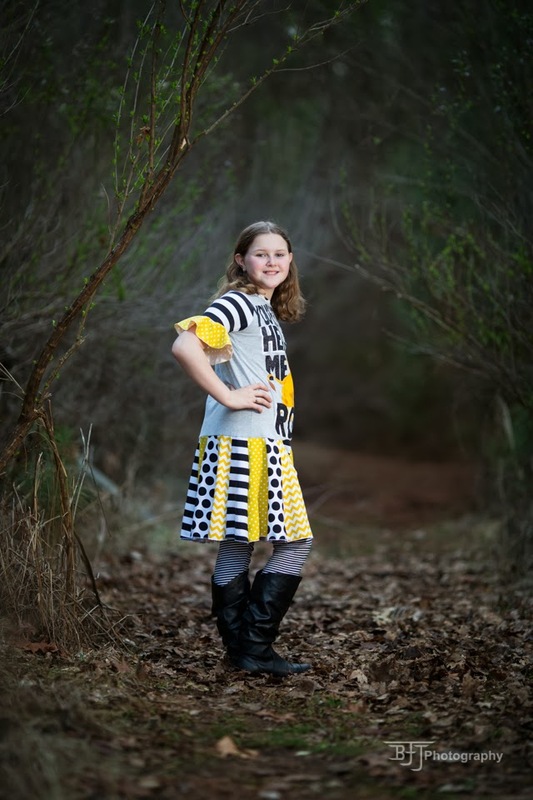 AND actually we are still doing Create Kids Couture (www.createkidscouture.com). 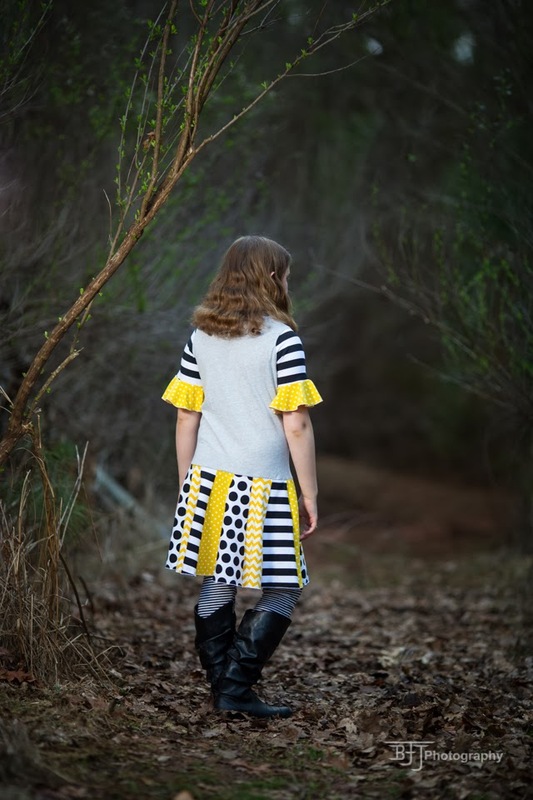 AND actually we are doing the Tessa again http://www.createkidscouture.com/tessas_tweens.html BUT we are doing a different option to mix it up. The Tessa has the option of the circle skirt (single or multi layered) or a stripwork skirt. 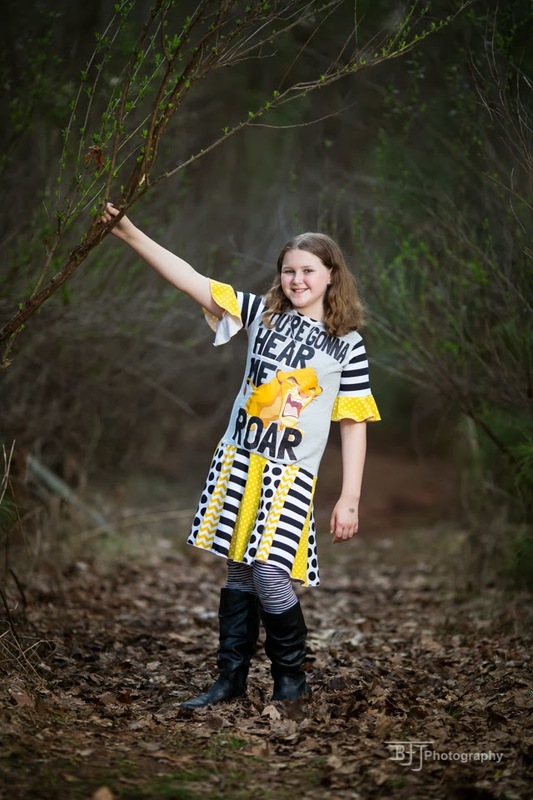 Today I am featuring the stripwork shirt using another upcycled Walmart Lion King shirt. 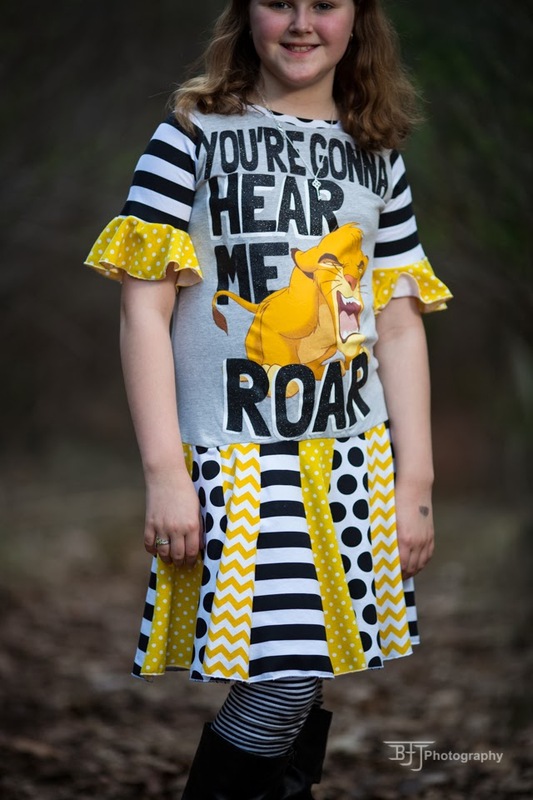 http://www.walmart.com/ip/Juniors-Simba-Hear-Me-Roar-Graphic-Tee/34335260. 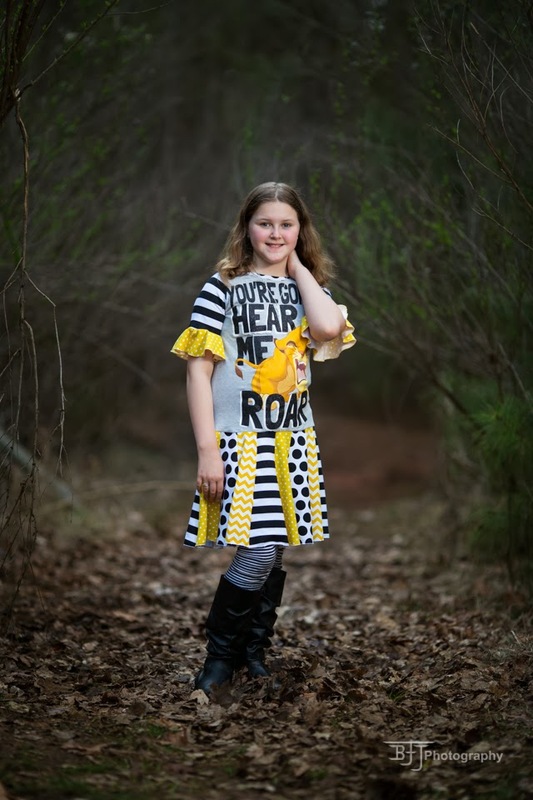 She loved this one because she loves Simba AND she loves the Katy Perry song. 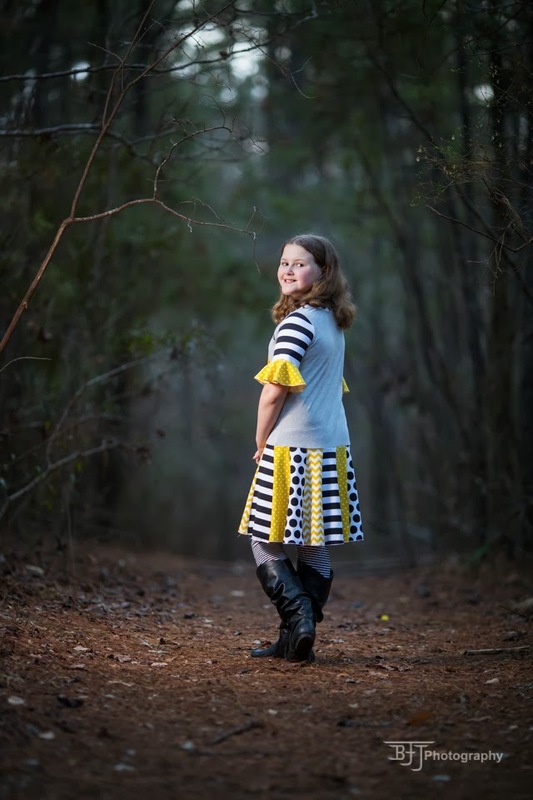 So, here we have another Disney inspiration using the Create Kids Couture Tessa! Thanks for stopping by and remember, I'm all EARS when it comes to some Disney sewing ideas. And, she just finished her last book for her AR points. Talk about cutting it close. Ugh! It looks like she will have all As and 2 Bs this 9 weeks unless something super crazy happened today or happens tomorrow. The 3rd 9 weeks tends to be the hardest of the year for us for some reason. However, this has been one of her best school years so far and she has been very happy. We struggled for several years finally having to take her to get tested. We found out she has a slower processing speed and it literally takes her longer to get from point A to point B. She is fine IQ wise. She goes to tutoring for math twice a week. My oldest breathes and makes straight As. For her to make straight As or mostly As is work, so I am always proud of her. One of the Bs is an 89, too, so bleh. I hate 89s. I wish they would be just like an 87 so you know you weren't -><- that close. But, hey, we will take it. Thanks for stopping by and we will see you next week! !